So we have been rearranging things here on the farm… and we aren’t done yet! First, Maxine took a fun little trip over to her boy-pal Jason and will stay for a few weeks. He’s a big ole’ buck who knows how to get things done. Let’s just hope Maxine can get her lady parts ready and willing to grow some healthy spring babies. Let me also tell you that this was not her first trip in my SUV… however, this was the first time I loaded her up and had to worry about her climbing over the back seat onto my 3 year old daughters head. Every other time the kids were all in school, but this time we had to get it done so the kiddo came along for the ride. This also made for an interesting conversation when we placed Maxine in with Jason and he suddenly began grunting, tongue hanging way out and jumping on the back of her. She screamed, “MOMMY WHAT IS HE DOING TO HER!!! !” Thankfully she was happily destracted with a sweet farm-kitty who came up an eagerly rolled over for some love and attention. … we might just have to look into getting a farm kitty soon. 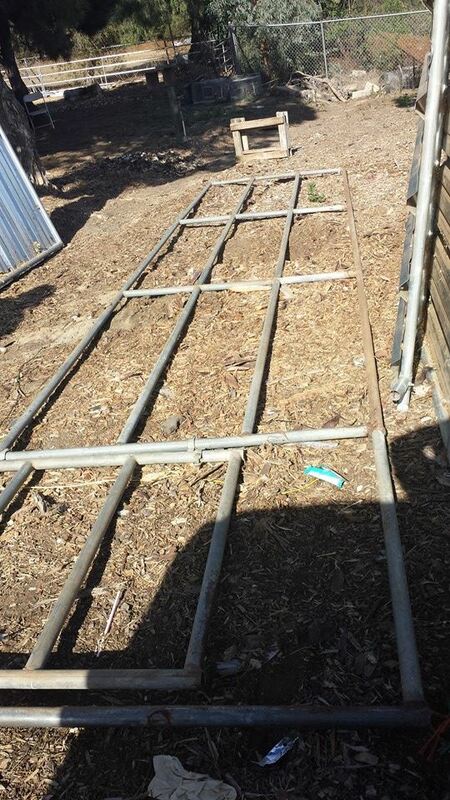 Next up, once Maxine was gone we took apart our pen we built with horse corral panels and built a seperation that would now be the “Pig Pen” for Geezer and his new friend that would be coming to join us the following day. Then we were going to close up Maxine’s section with a new 24′ panel with a gate we bought from a friend, but as it turns out, the panels we had were built for a mini horse and the one we bought was too large and although it would still connect, it just didnt fit right and looked ridiculously out of place with the rest of the pen. SO while we are trying to sell the panel on craiglist we will be eagerly looking for another 24′ MINI corral panel with a gate to put in it’s place. Anyway, Geezer moved over to his new digs and he loved the dirt and mud in the pig pen. My son spent some time right after school visiting with Geezer and making sure he was comfortable in his new space. I think he was quite relaxed and happy and my son agreed. It is so sweet to see a piggy stretched out in the sunlight nestled into the dirt. Then, once Geezer was comfortable in his new place I cleaned out his old spot; the old dog kennel. I hosed it out and pulled out all the old dog houses. I cleaned it up and brought over the food an water dishes for Astro and Trixie, then despite their complaints, I carried them over as well. After huffing and puffing about being carried, they were quite content to explore the new area and hop up on the back shelf and pretend they were up in the trees. I hope now they will be happier with all their space to frolick around and that they are in the center of the property so they can see everything going on. I have got to also tell you that, with rescuing these pigs, has come a WONDERFUL experience with the ‘pig whisperer’ Andrew. He is SO amazing and the pigs just adore him (or maybe its the animal cookies in his pocket!). When he transported Geezer down to us the first time from his home up north, it was such a smooth and easy transport that Geezer came out of the crate happy and calm. Andrew then stayed a while talking calm and sweet to him, continually giving him treats, pets and occassional kisses so that he felt comfortable an welcome in this new place. It was truly a blessing. Thankfully Andrew was available for Roni’s transportation as well. When they arrived, my dear husband helped unload the crate from the truck and then we let Andrew work his magic. She slowly eased her way out of the crate and over to her food an water bowl. After chowing down and taking a few sips he continued to talk gently to her as he walked towards where Geezer was hanging out in the sun. She stopped a few times to check out the roosters and sniff the dirt, I am sure she was overwhelmed with all the new scents in the brand new environment, but she was relaxed and her tail was wagging away. Once she and Geezer were together in the same space (because you know, when dealing with things like this you are on pig time, not your own…so that means LOTS of waiting while they wag their tails and slowly waddle around) Andrew was so calm and patient with them… giving sweet praises to them when they showed good behaviors and gently correcting them if needed. My son got to help at one point when Geezer was in the pen and we needed him to come out and interact with Roni. He jumped at the opportunity to prove that he really is the Pig Whisperer he thinks he is. And dont ya know it, no sooner did I give up trying to get Geezer’s attention, did my son step in and whistle once did Geezer perk up and follow him happily wagging his tail. darnitall! By the end of the day, there was a little blood shed, some dust kicked up in the air, but all in all their introduction went very well. I am excited to get out there tomorrow and see how everyone is feeling. Not to mention I need to get started on the next up on ‘Mo’ and the gang of teenage chicks. Now its time to move them over next to the main coop so the little silkies and rhode island reds can start acting more like chickens and not like the daddy bunny who raised them!